If you’re one of the millions of people that are celebrating Easter, you’ll be glad to hear that the holiday didn’t go unnoticed by some of your favorite Bitcoin casinos. Namely, to mark the special occasion, Fortune Jack will be giving away a special bonus that’s open to any registered player. And if you’re not interested in spending your holiday weekend on casino slots and selected table games, BetKing has likewise launched a new and sleek poker client with a special rake tournament that will be open for the Easter weekend. Simply called the “Easter Bonus”, Fortune Jack’s new promo launched yesterday and it is up for grabs by any player who makes a qualifying deposit and uses the special bonus code – “BASKET80”. 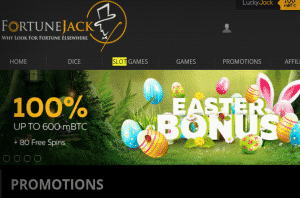 The maximum amount of bonus money you can get with this special offer is 600 mBTC, but to make things even more interesting, Fortune Jack will also throw in 80 Free Spins on top of that offer. The minimum amount you have to deposit to claim the bonus only is 0.002 BTC. However, if you want to grab both the bonus and the Free Spins, you’ll need a minimum deposit of 0.015 BTC. Once you meet this criterion and use the bonus code, the casino will instantly release your bonus money and give you 10 days to spend it on a wide selection of games, including both slots and table games. As for the 80 Free Spins, they will be released 20 a day for the first 4 days after claiming the bonus. The spins are given on selected Pragmatic Play slot games, which means that you’ll also get to enjoy great entertainment apart from free rewards. If you want to learn more about this special holiday bonus, just go to Fortune Jack Casino and find the “Promotions” menu. At the start of the month, BetKing announced the launch of a new Poker room that was added as a planned expansion to the recently re-launched site. The Poker room is meant to give Bitcoin Poker players a new and modern place where they can enjoy variants like Pot Limit Omaha and NL Texas Hold’Em, be it low-stakes tables they are looking for or exclusive VIP tables with high betting limits that are reserved for veterans and bigger spenders. To jump-start its online Poker action, the site has launched a new Rake Race which from now on will be an ongoing tournament at BetKing that’s open to any player. Starting each week, the casino will open three different rake races. One leaderboard will be reserved for the micro stakes, one for the low-stakes, and one for the mid-stakes game. There are 50 prizes in each leaderboard but they differ in size, depending on whether they are for the micro-, low-, or medium-stakes tables. The biggest main prize (for the #1 player) is $1,000 for the medium-stake leaderboard while the lowest possible prize is $7.5 for the last positions in the low-stake race. To qualify, you just have to spend 0.1 mBTC on a No Limit Hold’em, Open Face Chinese, or Pot Limit Omaha game to win 1 point. The more points you have, the higher your position on the leaderboard will be. If you are ready to take this challenge or even if you are simply curious about the new Poker room at the casino, feel free to check out BetKing today.